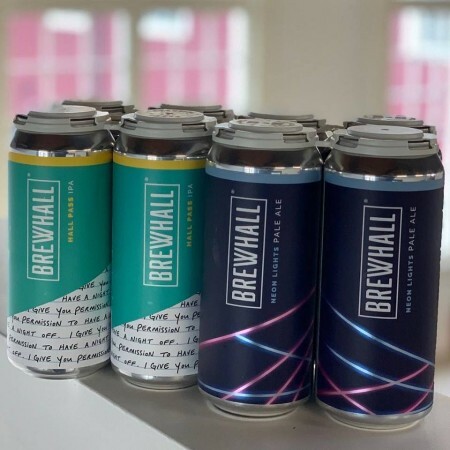 VANCOUVER, BC – Brewhall, the craft and food hall owned by Vancouver’s Tap & Barrel Restaurants, has announced the launch of “beer-to-go” retail sales. Starting today (November 28th), two of the brewery’s core brands – Neon Lights Pale Ale (4.5% abv) and Hall Pass IPA (6.2% abv) – will be available to purchase in 4-packs of 473 ml cans. In addition, the first 50 4-packs sold will include a gift card for an order of Famous Fried Pickles or a Soft Baked Pretzel in the Brewhall restaurant. Retail sales will start today at 11:00 AM at the downstairs bar at Brewhall.